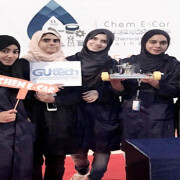 Five students from (GUtech) scored third place in the chemical car competition organized by a group of chemical engineers at Sultan Qaboos University (SQU) where a group of chemical engineering students from various universities and colleges in the Sultanate competed. The main idea of ​​the competition was for students to design miniature models of cars which operate by clean eco-friendly chemicals within certain basis and criteria such as time, distance, safety, and design. Five students from the Processing Engineering Dept. invented a mini car operates by the combustion of ethanol solution, which generates thermal energy working on heating the device and generating mechanical energy to move the car. Malak, a third year participating student from GUtech, said that their participation in this contest polished their challenge, innovation and patience to achieve success. They have chosen this vehicle after working on several different designs during a short period of the contest announcement, and that participating in such competitions designed to motivate students and encourage them to innovative, while the high competitiveness of the contest worked to hone their leadership skills and to highlight the amazing local talents GUtech students have. BARKA The Shell Eco-marathon team of the German University of Technology in Oman (GUtech) has conducted a test drive with its new car last Thursday. For the second time a GUtech student team will be part of the Shell Eco-marathon Asia, in the Diesel category, to be held in Manila (Philippines) next month. 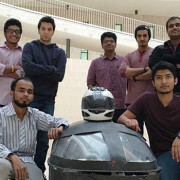 “Our main aim was to make the car faster and to reduce the weight,” said Mohammed Omer, GUtech BEng alumni and the team leader of the GUtech team, comprising of 12 members. The Rectorate of GUtech and Engineering professors were attending the test drive of the Eco-car that was designed and built by the students themselves in the past months at GUtech. They were impressed of the result. “We are very pleased to see the result of the student s hard work throughout the past months. What they are doing is not only the design and the construction of the car. They have to deal with all aspects of a project: finances, sponsors, advertisement, organisation of the project and so on. It’s a great experience for them and for their future professional career.” said Professor Dr. Michael Modigell, Rector of GUtech. The students started designing the car in October last year. Everything was produced at the GUtech workshops, working long hours and in their free-time. “We had to start from scratch again. We are using a different material and we wanted to use less moving parts and a single stage drive only,” said Mohammed. “The mold-making of the body of the car took 2-3 weeks,” said Mubashar. The team has improved the features of the car. “This year we made a carbon fibre mono car. Last year our car was made of aluminium. Our car is much faster than last year and it is much lower and lighter,” said Mubashar Kabir, also a GUtech BEng alumni. Like last year Mubashar is driving the car. Major parts of this new prototype car are the result of three Bachelor theses that were conducted last year. Mohammed Omer’s thesis was on the chassis design, Mubashar’s on the body design and Azeem’s on the improvement of the wheels. “I believe the students did a great job. I am sure we will give a very good contribution in Manila. The materials they applied in the new prototype will play a key role. To reduce the fuel emissions engineers around the world try to reduce the weight of the car. The students also used ceramic bearings to minimize the friction of the wheel,” said Dr. Emanouil Bouzakis, Senior Lecturer at the Department of Engineering at GUtech and technical supervisor of the Eco-marathon team. Compared to last year the new car is 30 cm shorter and much thinner. 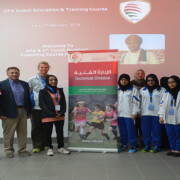 Last year the student team won the fifth place and were the only Omani team to succeed in the competition. After passing the technical checks and improving the different features the students drove 12 kilometers with just 73.45 ml of petrol in 27 minutes last year in Manila. This corresponds to a specific fuel consumption of 0.6 l per 100 km. Around 100 teams participated in the Shell Eco-marathon, but many failed the inspection tests and therefore were not accepted for the race in Manila. The student’s hope that their ideas and inventions can contribute to building eco-friendlier and lighter cars in future. Omar and Mubashar are planning to continue with a Master’s degree at GUtech’s partner-university in Germany, RWTH Aachen University, this year. Mubashar would like to study Aeronautical Engineering and Mohammed will apply for studies in Biomedical Engineering. However, they are concerned about the future of the car industry. “As long as there are natural resources fuel is available, but those resources may deplete after some time. It is a challenge to find other solutions without compromising on our mobility,” said Mubashar.